Tentlabs shunt regulators are designed to upgrade power supplies of both analog and digital circuits, mostly found in CD/DVD players, DACs and similar audio equipment. Substituting, or adding these regulators enhances the sound quality in terms of transparency and resolution, at reasonable price. Connections in general are easilly made. This type of upgrade requires little knowledge of electronics hence is accessible for every enthousiastic audiophile DIY. 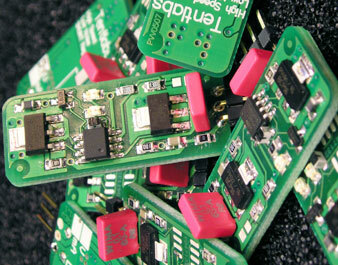 Traditionally used voltage regulators never have been designed for audio applications. As an example, the very popular 7805 initially was designed as a voltage regulator for digital logic and low micro controllers - who cared about bandwidth or output noise. Derrivatives like 7815 and 7915 are widely used to supply the analogue output stage of CD players. About time for an upgrade! The shunts consist of an active, wide band, current source to isolate the input from the output. The output is regulated by an active shunt regualtor with both low output noise and wide (typically > 200kHz) bandwidth. For RF frequencies, a Wima capacitor is integrated on the board, which in total measures 15*35 mm. Read the application note here for more information. • Supply input: typically 2 V above output voltage, maximal 6 V above output to minimise heat. • Higher input voltage are allowed when a series resistor is place at the back of the regulator, see application note. All regs come fully assembled and tested with a 5-year full warrantee, assumed they are mounted and used according instructions.